The other day I was reading about point-of-action queues and their impact on stair climbing behaviour and I came across this study, ‘Take the stairs instead of the escalator’: effect of environmental prompts on community stair use and implications for a national ‘Small Steps’ campaignIt's a straight forward paper that looked at 8 studies and the impact they found stair climbing prompts in heavily trafficked areas had on stair climbing behaviours. The authors found that simple point-of-action signage and prompts led to a nearly 5% increase in stair climbing among women and half that among men. 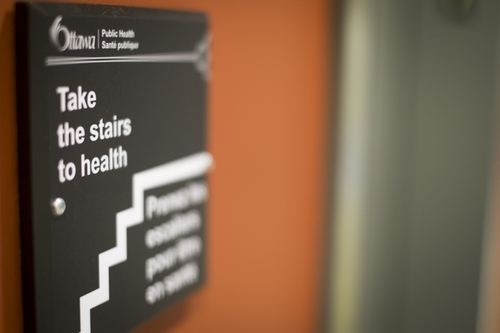 Their work also predicted that every week those signs stayed in place led to 2200 new stair users. "The projected effect on correcting energy imbalance appears small, suggesting that this intervention alone will not have a potent effect on leveraging population-level body weight or obesity prevalence"
But as I've calculated before, to burn the calories of a small Snickers bar you'd need to climb 122 flights of stairs. That researchers apparently wondered whether or not a few extra daily flights of stair climbing in malls and office buildings would have a dramatic, let alone any, impact on weight, frightens me. Truly, that weight was included as a discussion piece in this study speaks to just how widespread, even among those who really ought to know better, is the erroneous belief that physical activity is such a large player in weight that even tiny increases to it might lead to weight loss.